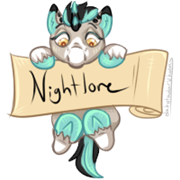 If you are a pony customizer I recommend you look through this article and see if any of your customs have been featured in it, scroll down to the "contact us" link at the bottom and get your work taken off this article. It is offensive and oppressive. 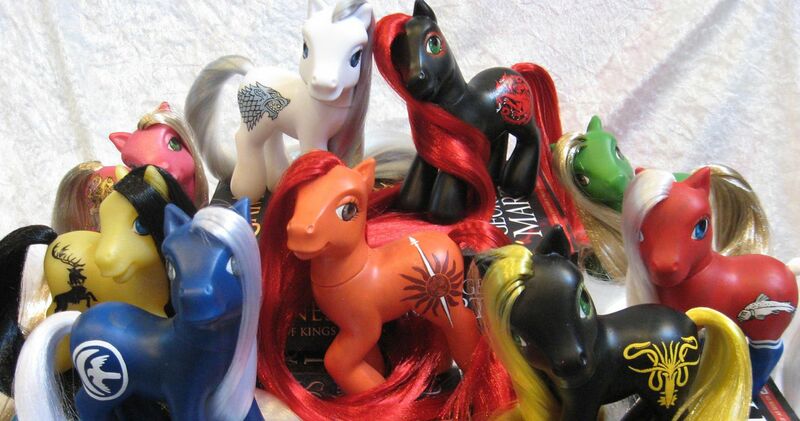 There are several creators out there who have found a creative outlet with creating custom ponies. Unfortunately, not all ponies are created equally. Those customs are all gorgeous, most of them expertly done! Is that article really slamming them because they don't fit the "theme" of MLP to be for "little kids/girls"??!? That they're not "appropriate" (appropriate being in quoation marks even in the article itself. "Won't anyone think of the children" indeed)? Ugh. People are allowed their opinions, sure... but this is just closed-minded, and a very limited-mindset to creative expression, etc. It's sad and disappointing. I feel sorry for all the custom artists whose work ended up here. I'm pretty outraged at it cause I for sure expected mine to end up in it. None did but I don't like seeing others being posted like that either. The article lost me at the headline when it said "these creations shouldn't exist. " Some things just don’t make sense unless you’re part of a fandom, so unless you are part of the fandom you don’t have the experience to judge it. This is a common problem for a lot of creative outlets for fandoms, not just pony customs. Fan art and fan fiction suffer from this kind of outsider judgment a lot too. None of my silly customs are in the article, but I still sent a letter. It's offensive that someone who isn't a part of the fandom is judging it. They didn't post all the artist's names and didn't get their permission. Btw, I'm not a horror fan, so most of them weren't ponies I would personally be interested in, but most were done with a high level of skill. The artist's put time and work into such details and don't deserve to have their hard work bashed by someone who doesn't necessarily have an unbiased view. These people don't know the skill and time that is put into the customs. They have no write to judge others work much less make a article about it. Don't like them fine just don't drag them through the mud in a article. I've been told one of my custom should not exist and should be thrown in a fire. I can't image what the artist of the lovely custom are thinking about this. Exactly. I know that I'd be FLIPP'n hamburgers if they posted about mine like that. I think it's good to bring this to light so the site can know that this type of journalism (if you can call it that) isn't acceptable. Permission should always be granted. I'd feel crushed if my customs were on there. only thing that ever keeps me going after feedback like that, is if other people keep buying my work to show me that it's just fine. if I didn't have support I would have quit like a decade ago. And no one should ever have to feel like that. So, I’m a very passionate person. Let’s just say they got a very long and very unapologetic email about that article. I’m all about having freedom of speech and voicing you opinion on things but this “article” went way beyond a critique. It was (not well) written to be hurtful to the people who make and buy MLP customs that don’t follow the pink and pretty agenda set by Hasbro and mainstream media for little girls - who are the only people who should like MLP of course. This enraged and bothered me a lot. What the author seems to completely fail to grasp is the fact that none of those customs were ever marketed toward children. They are completely appropriate as the art work they are intended to be, and most of them are pretty darn amazing! If you look at her articles, she's pretty much a hack who finds a theme, steals other people's pics off the internet then writes snarky stuff about it. I hope they don't pay her for this garbage. That author is ridiculous. The bright side is that I now want to seek out these artists and buy their customs because so many are flat out AMAZING! This article is absolutely disgusting. I know I'm late to this thread but I feel the need to mention that when I was little I absolutely loved looking at these sorts of customs. As an artistic child, they seriously impressed me with the level of detail and the effort the artist went to. 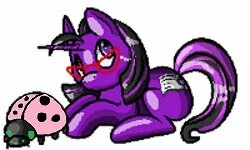 One of my favorite customs to look at when I was eight or nine was some sort of undead pony (I don't remember who made it but it was gorgeous, oh my goodness). Children are all different; some are more mature than others and can appreciate darker themes, or at the very least, the effort involved. If your child is seriously so sensitive that this stuff would bother them, you probably shouldn't be allowing them to use the internet. Yeah they're not everyone's cup of tea, but you cannot deny the amount of talent and patience it takes to make any of those customs. Also she seems to be laboring under the impression that the customizers are trying to fit these customs into the MLP universe, which...lady, ever heard of AUs? Or the real world where people are allowed to make crafty things for fun? I feel sorry for her in some ways. The fact that she can only find happiness by making fun of others' hard work is truly sad. My 7 year old son has had a fascination with vampires and zombies lately. My daughter has been fascinated by zombies since she was 6. I, personally, wouldn't have wanted a darker toy when I was a kid and still have trouble with nightmares if I read or watch anything that disturbs me. (Nightmares and dreamscapes by Stephen King was not a good thing for me to read) My daughter hasn't had any trouble, though, and I can appreciate the artistry and time put into any custom.